Innovation has been a constant part of Benoît Rolland's work. His improvements to the bow as well as fundamental inventions contribute to the traditional wood bow and also to synthetic bows. - Galliane™, in 2013: concept of a frog that sets the bow hair ribbon at an angle. A frog, for the first time in history, is conceived for the string playing technique and the musicianÕs natural arm movement. It can be fit on any existing bow; it is a fundamental evolution of the classical bow. 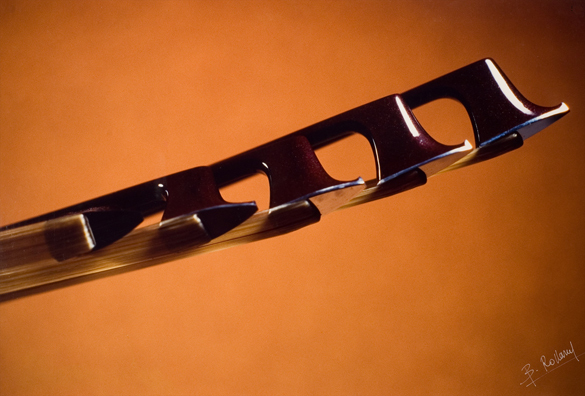 - Spiccato® a carbon fiber bow of concert quality, in the early 1980's. The bow associated two levels of innovation: a new technology in synthetic materials and a revolutionary mechanical concept that allows the musician to adjust the camber of the bow stick at will. Benoît continues his research on substitutive materials. He also designs new functional concepts for bows. He also creates new aesthetics for the bow and frog. To mention just an example of improvement, Rolland systematized in his bows the inner brass lining of the end stick that Persoit and Pajeot once sketched on a bow. The lining prevents the risk of frog breakage that occurs when the frog adjustment loosens as the wood wears off inside the stick under the action of the screw. 1- Always refining his understanding of what makes a fine, Benoît Rolland accumulates observations and analyses regarding the bows and their musical responses. He incorporates this knowledge in the pernambuco bows that he creates and in the restorations that he accomplishes. 2- Benoît is currently working on a prototype for a new concept of bow that he hopes to present to the musicians in the coming years. 3- He participates in innovation forums, physics of the music symposiums, and various research projects regarding innovation and bow making. 4- He also conducts a scholar research about the history of French bow making, replacing it in a larger context. His wife Christine Arveil contributes to this research and progressively records in writing Benoît's knowledge and observations about bow making and music.